It’s every autism parent’s worst nightmare. You turn your back for a few seconds, and when you look, your child is gone. This nightmare is the reality of the Lynch family of Clearlake, California. 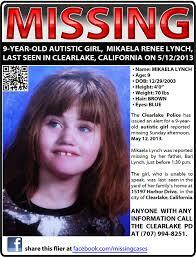 Just yesterday, 9-year-old Mikaela Lynch went missing from her waterfront home according to police. Mikaela is non-verbal. As soon as I saw the words waterfront home, I froze. 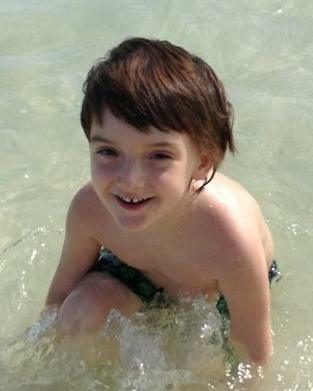 Autistic children are drawn to the water, and all too often it is deadly for them. 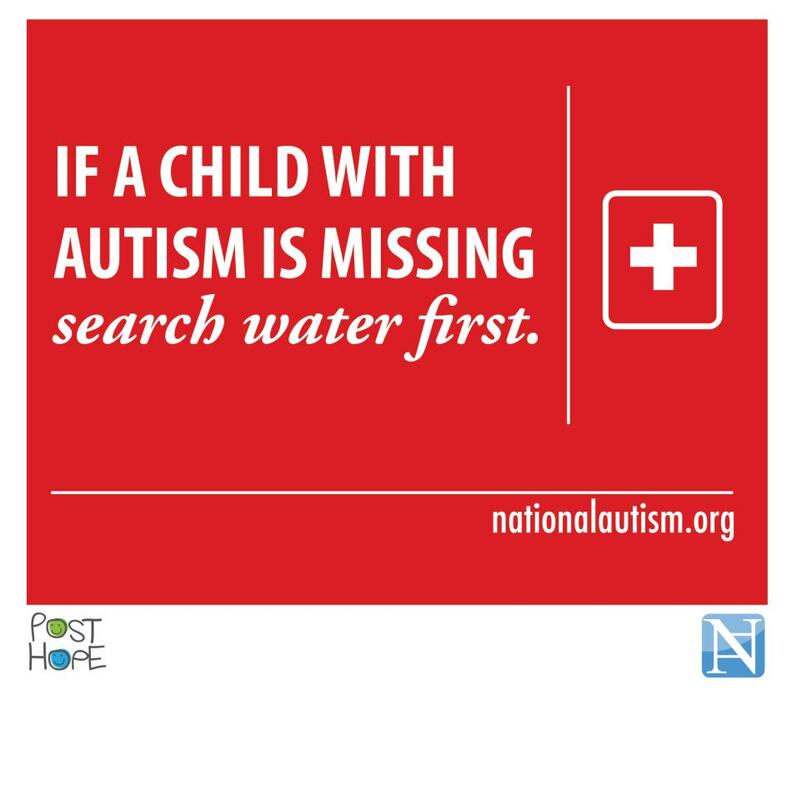 From 2009 to 20011, accidental drowning accounted for 91% of total U.S. deaths in autistic children ages 14 and younger, subsequent to wandering/elopement, and these are only the ones we know of. Of those, 23% were in the care of someone other than a parent (www.nationalautismassociation.org). Last fall, Kennedy Krieger’s Interactive Autism Network (IAN) published a study in Pediatrics which found that 49% of children with autism attempted to wander between the ages of 4 and 17. 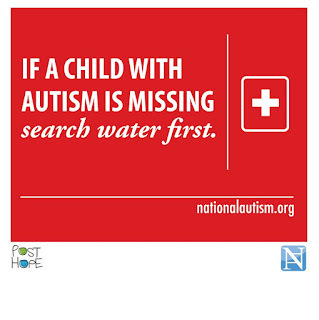 The study emphasized that first responders should always check water first when searching for a child with autism because so many are drawn to the water. According to the study, 24% of the missing children had close calls with drowning. I was a respondent in that study. Ryan is counted in that 49% of children who elope. We live only about 100 yards from the ocean, and Ryan goes there to the beach several times a week. He loves it and he knows how to get there, and like Mikaela, he cannot call for help. I've become almost obsessed worrying about Ryan wandering off our property and heading down to the beach. He is smart and knows how to slip by us. It takes only a few seconds' distraction and he can disappear. The stress of always being on guard is enormous. I’ve seen articles blaming Mikaela’s parents, but I understand just how easy it is for a determined and silent child to slip away. Ryan’s escape antics have happened more times than I care to admit, and my heart stops beating in my chest every time. I hope for the Lynch family Mikaela is found safe and sound, but each passing hour makes that more and more unlikely. Tonight I'll give Ryan an extra big hug, and keep a hand on his leg as he sleeps between my husband and me, as he does every night...and wonder if I'll ever be able to let him sleep in his own room. I have high funct autism i am young adult. I had a few close calls with drowning but not by elopment. My parents got me swim lesson but sadly kids like this will not understand what swim teacher try to show them. Best choice is get a gps bracelet or necklace so the child can be found quickly. Train teacher and babysitter in case of elopment is also necessasry. Ryan can swim, but he's no match for the Pacific Ocean! We keep a close eye on him, but he is uncanny at knowing when your attention is diverted...and he is quiet. When I'm cooking family meals is his favorite time to try to escape, so I have the other kids tag team him.